To show modern Palestine both in its people and its institutions, we popped into Birzeit University. 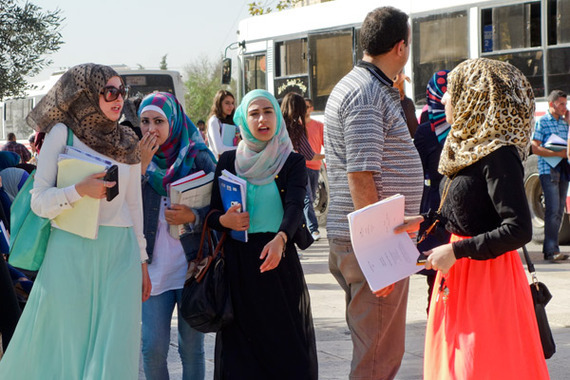 Its campus, at the edge of Ramallah, has an enrollment of about 10,000. With beautiful landscaping connecting modern buildings and a student body that seemed like the future leaders of this young country, the campus was a huge contrast with the intense and chaotic cities. Strolling through the campus, I sensed a younger generation working hard for a stable and prosperous future. My agenda was to connect with young women and learn a bit about the status of women in Palestine. Along with many other things, I’m curious about the beautiful hijab, or head covering. I’ve noticed that some women throughout the country wear it, while others don’t. We’ve filmed a series of interviews with people from many walks of life in Israel and Palestine to be used as DVD extras for our Holy Land special (and, I hope, for radio interviews). Our guide set us up with these three women. They were majoring in architecture and civil engineering and spoke English well. We had a delightful conversation about the role of women in a Muslim-dominated society. They all agreed that there were more women than men here in higher education, and that they can do anything if they work hard. Still, the consensus was that a woman’s role is generally to raise children and run the family, while the man’s role is to be out making the money. 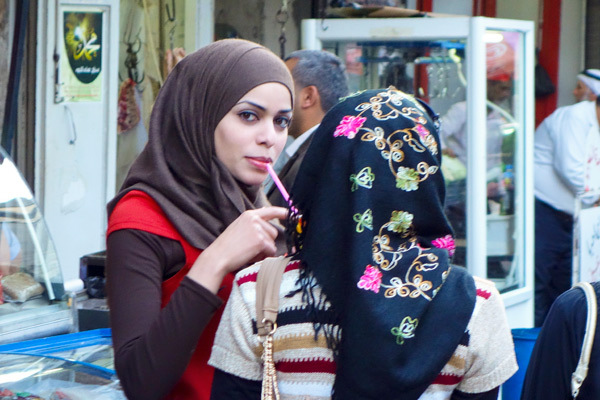 The women I talked with agreed that women are free to be individuals in Palestine, and that choosing to wear the hijab was entirely up to them. The woman who covers up is just as socially active and in on all of the jokes and fun. But when she walks in public, she feels she gets more respect. While a woman on the street wearing a scarf is treated differently, that doesn’t mean she isn’t fashion-conscious. One woman I met told me that she has over a hundred scarves, and each morning, she enjoys choosing one that fits her mood. It’s an ensemble. You never wear pattern-on-pattern or solid-on-solid. If the dress is solid, the hijab will be patterned. And color coordination is important, too. Many women are sure to have toenail polish, handbag, lipstick, and scarf all in sync. ← A Muslim, a Christian, and a Jew walked into a church in Texas . . .